Companies need to process massive volumes of new information each day. Loads of letters, invoices, and contracts in paper form land on employees’ desks. The result: overflowing file folders and sky-high paper stacks. There’s an alternative method that allows you to lastingly save on time and costs: digital document capture. enaio® merges information that reaches your company, is created within your company, or is already available – whether it is digital or analog. Every incoming invoice and all printed information can be digitalized. Metadata can be extracted, and all invoices, information, and metadata can be further processed and stored in a digital, audit-proof way. To facilitate the process, high-performance features for scanning and interpreting documents are available. Optimal processes guaranteed: from scanning to indexing. Directly archive your scanned documents via barcode recongnition. enaio® processes as many documents types as desired, including in batches. Archiving solutions need to uphold legal deadlines. enaio® assists you with this challenging task. You can effortlessly process even large volumes of documents within a short period of time. Thanks to barcode recognition, invoice receipts and documents are quickly, reliably captured, imported, and automatically stored in the right location in enaio®. If desired, recognition of valid barcodes can be restricted to regular expressions. A text recognized through barcode recognition will be filtered through a regular expression defined for the relevant barcode field. enaio® capture scan provides comprehensive features for scanning any documents you would like in black and white or in color. It also enables you to access many features of the scanner software in use (TWAIN/KOFAX) for automatic image processing. You can directly capture small to large volumes of invoice receipts at the client workstation. The scan components of the enaio® client enable the use of various interfaces for controlling scanners. enaio® scan supports the capture of individual documents and small volumes of invoice receipts in batches directly from the enaio® client without requiring an additional program call. Individually scanned pages can be grouped during batch capture. You can select one or several pages and combine them into a new document. Then, you can store this with the desired process in enaio®. You can add, replace, or delete additional pages before a document is archived. Meticulous preparatory steps, such as manually attaching barcode labels or adding separating pages, are no longer necessary. enaio® capture basic is the central capture component of enaio® that enables efficient mass invoice receipt capture through fully automated scanning and import. enaio® capture basic also has its own workflow features and particularly impresses in areas in which absolutely reliable processing of very large volumes of paper invoice receipts is required. 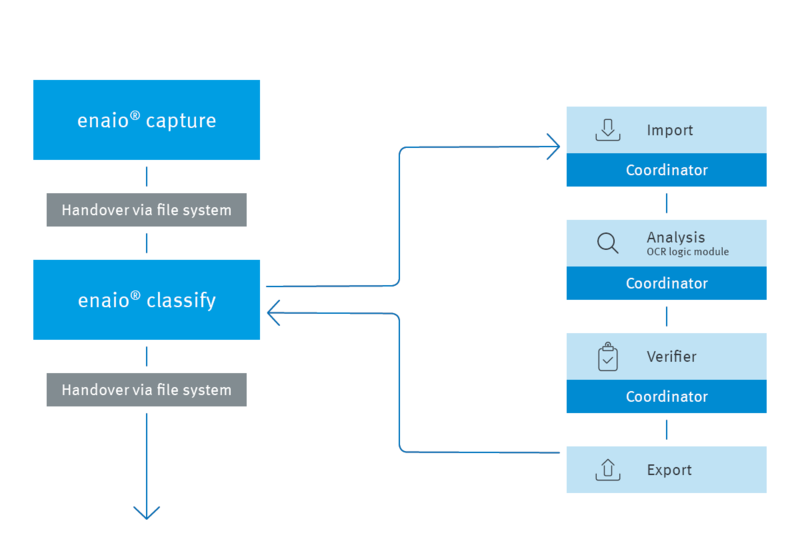 Documents captured using enaio® capture can be immediately handed over to the enaio® capture workflow system following import. In the process, each imported record can trigger one or several workflow processes. All relevant documents can be sent via these determined processes or ad hoc adjustable processes without requiring further processing. In order to meet all the challenges associated with the nationwide social insurance program, BMW BKK launched the ‘paperless office’ project made possible by digital archiving. For example, we scan the inboxes in the tax department and distribute them electronically so that we could eliminate microfilming for tax assessments. Meanwhile, we determined that avoiding the use of paper poses a great challenge and involves making significant changes to the work process. However, the solution is easy to use, and can be flexibly adapted to our respective needs. In the past, we lugged around invoice receipts throughout the company. Moreover, the physical separation of our locations and construction sites meant that we had to spend a great deal of time comparing information over the phone and via fax. Now, we carry out automated, centralized invoice receipt capture directly in the inbox. We no longer have to spend vast amounts of time on comparisons, invoice processing is carried out quickly and efficiently, and above all, we can do it on a daily basis.